Sharp or Flat Ear Training Game to the Rescue! The Sharp or Flat Ear Training Game is a great way to "save" a lesson that is going off-track. 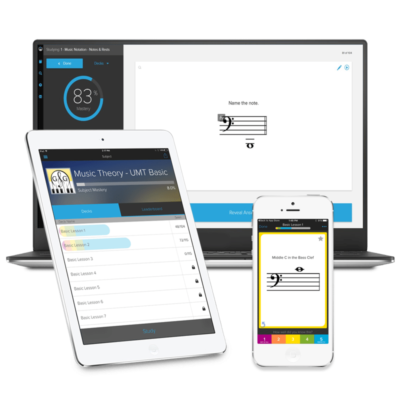 It is so easy to use your Ultimate Music Theory Workbooks and UMT Games to add Sight Reading and Ear Training Components to a lesson with the Sharp or Flat Ear Training Game. 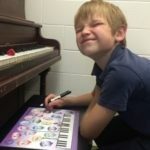 This is the story of how, once again, the Ultimate Music Theory Basic Game Pack came to the rescue! Using the Basic Game Pack, I encouraged a student to use his ears to identify a sharp or flat by playing "The Sharp or Flat Ear Training Game"! When a sharp or flat is added before a note, it changes the pitch of that note. 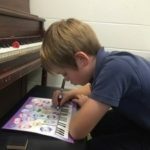 Lesson 7 in Prep 1 Rudiments introduces students to that semitone or half step through writing and matching the notes to the keyboard. I encourage you to take the Prep 1 Rudiments Workbook to the piano and have your students play these distances. When playing the Sharp or Flat Ear Training Game, ask your students if they can hear what happens when you add a sharp or flat to a note? One of the exciting parts of being a teacher is that you get to work with students of all Learning Styles - Visual, Auditory, Kinesthetic and Special Needs. The challenge can be to meet their needs - needs that change depending on what else is going on in their lives! Have you ever had a student that is just so excited about upcoming events, they just cannot concentrate at their lesson? Jaydon had that kind of lesson last Wednesday. 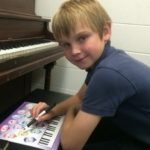 Between pieces and marking his Lesson 7 Review Test in his Prep 1 Rudiments Workbook, Jaydon was just a bundle of energy and excitement. I heard all about his upcoming camping trip, the cold pea salad that his grandmother was going to make (I want the recipe! ), the sleepover birthday party that he was going to be invited to, etc. Needless to say, Jaydon was having a lot of trouble concentrating, keeping his bottom on the piano bench and his mind on his music. 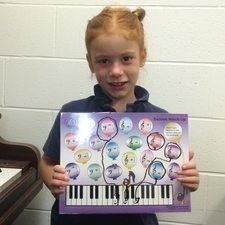 Instead of getting frustrated, I grabbed my Ultimate Music Theory Basic Game Pack and pulled out "Balloon Match-Up" and we played the Sharp or Flat Ear Training Game. Playing the Sharp or Flat Ear Training Game! I "hid" a pencil sharpener on a white key on my piano keyboard. Jaydon had to come to the piano, find the sharpener and identify the key. Then he had to go back to his seat to find the balloon that had that note (at the correct pitch). When he found the balloon, he then had to close his eyes. I played the original note on the piano and then I replayed it with a sharp or flat. Jaydon had to write the sharp or flat in front of the note in the balloon. Then he had to match it to the keyboard at the bottom of the page at the correct pitch. Being the sneaky mean teacher that I am, I thought that I would fool Jaydon. 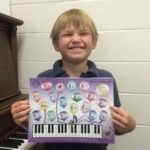 He matched the D Balloon to the piano keyboard. But then, instead of playing D sharp or D flat, I played D (natural). Did I fool him? NO! Jaydon had so much fun, he wanted to take the game home. He said, "This game that I played was fun! I liked it very much. Guess what? During the 15 minutes we spent playing the Sharp or Flat Ear Training Game, Jaydon stayed on task 100%! Learn More. Watch the UMT Basic Theory Game Pack Video Now! Buy your UMT Basic Game Pack today and find out for yourself how easy it is to add an Ear Training Component to the lesson - and to have fun! There's instructions included with 36 ways to play the 6 games... PLUS you'll come up with a few more ways to play on your own I'm sure. P.S. Join the Conversation! What do you think Jaydon's learning style is? What "hints" did you get while reading this blog?